Sore throats are a symptom commonly associated with infections such as the cold or the flu. They can be triggered by a weakened immune system, but they can also be caused by extenuating illnesses such as hay fever or self-inflicted pollutants like cigarette smoke. Here at A.Vogel Talks Sore Throats, our immune system expert Dr. Jen Tan examines the underlying causes of sore throats and recommends herbal alternatives to soothe any discomfort. 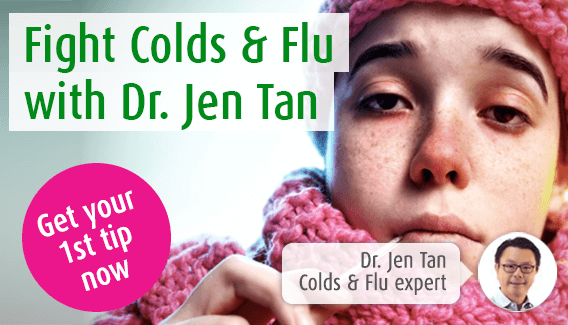 If you have any questions, feel free to ask Dr. Tan using our Q&A service. A sore throat is also known as pharyngitis. The throat (or pharynx) is the muscular passage visible when you open your mouth. It connects the nose and mouth to the oesophagus and lungs. The pharynx helps us control speech, breathing and swallowing. A sore throat occurs when the tissues of the pharynx become inflamed. Most commonly, this arises because of infection by viruses and bacteria, associated with the common cold or flu. Sore throats are common and it is said that the average person will get 2 or 3 of these a year. Sore throats, like cold and flu infections, are more commonly seen in younger people. This is because as a person gets older, his or her immune system has had the chance to build up resistance to cold and flu viruses. Sore throats are often part of the symptoms experienced with cold and flu infections. They may the first signs of these infections, or develop later as a result of subsequent (or secondary) infection by bacteria. These are only a few of the symptoms associated with having a sore throat. Sore throats don’t generally come alone but tend to be the result of another cause. The most common causes are viral infections associated with colds or flu, or a secondary infection by bacteria. Certain rare medical conditions such as cancer can cause a persistent sore throat. These are only a few of the causes of sore throats. For some more tips, see our article on the best home and herbal remedies for a sore throat. If you are suffering from an underlying health condition which suppresses your immune system, such as HIV, AIDS, leukaemia, whilst receiving chemotherapy etc. Looking for a treatment to help relieve sore throat symptoms associated with coughs, colds and flu? Then look no further than Echinaforce Sore Throat Spray made from the well known herbs echinacea and sage! To find local independent stores in your area that sell Echinaforce Sore Throat Spray, simply type your postcode below. Has your child caught the back-to-school bug? My daughter has a very bad sore throat. She's 6 years old, what can I give her to help heal it? I have a sore throat that is irritating and is making me cough. I have taken some antibiotics but it is still not resolving. What can I do? I tend to get sore throats at least twice a year now, and it takes at least 3 weeks or more to get over it. What can I do? As the A. Vogel Immune System expert, I recommend Echinaforce® Sore Throat Spray to help ease symptoms of a sore throat. On average, you will experience a sore throat 2 or 3 times a year but, if you are lucky, your immune system will be able to conquer the virus before it develops into a full blow episode of the common cold.